Water Environment Federation (WEF; Alexandria, Va.) staff have been busy making a difference in the community and local environment. During the past several months, volunteers have helped pick up litter, recycle paper, and donate sandwiches to those in need. 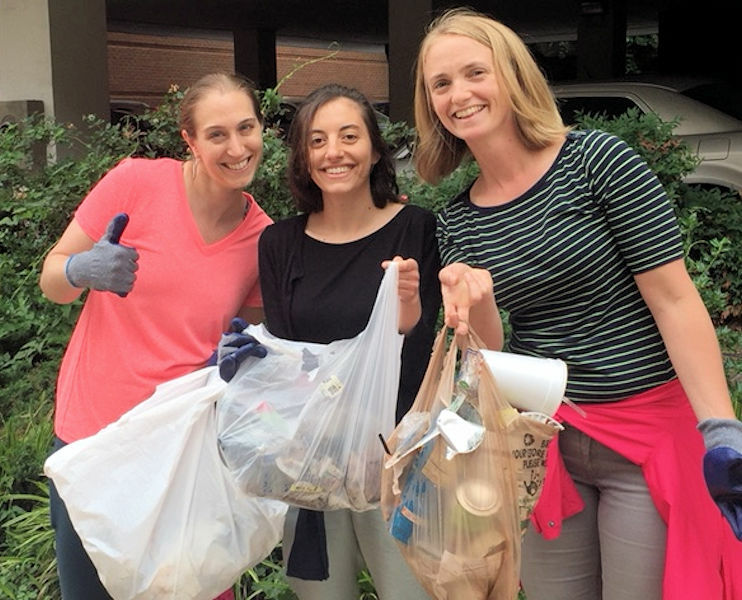 Water Environment Federation (WEF; Alexandria, Va.) staff, from left, Jessica LaFever, Katherine Saltzman, and Jessica Rozek, collect litter as part of the WEF “plogging” event. WEF photo/Rozek. WEF staff joined in a European trend called “plogging” that combines exercise with environmental stewardship. The term is a mixture of the Swedish term “plocka upp,” meaning “pick up,” and jogging. Ploggers carry bags to pick up litter while exercising. The WEF Eco group, which organizes environmental activities for other staff members, coordinated a series of plogging events in July. About 20 staff members, equipped with plastic grocery bags from the WEF recycle bin, pitched in to collect litter. During four separate, hour-long walks, participants collected enough trash to fill 24 bags. In February and April, WEF hosted two separate paper-recycling events for staff. The mobile shredding company, Shred Ace (Washington, D.C.), came to WEF headquarters to destroy and recycle paperwork. The company recycles 100% of the material collected. 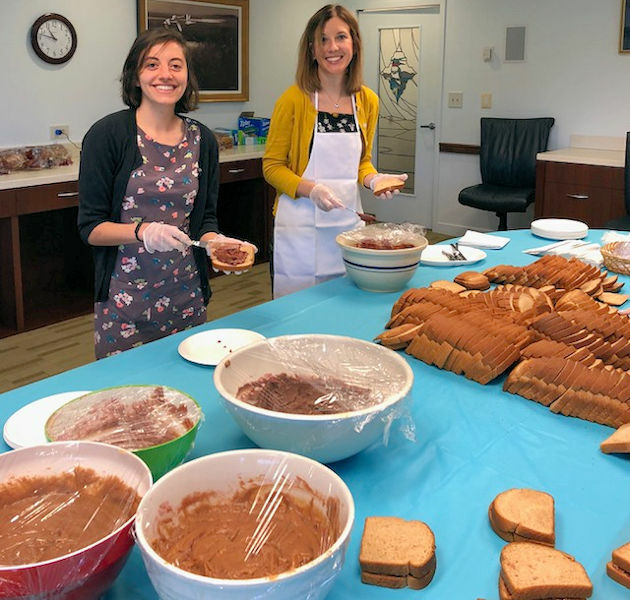 WEF staff including, from left, Saltzman and Kelsey Hurst, pitch in to make sandwiches to donate to the local community through Martha’s Table (Washington, D.C.). WEF photo/Camille Sanders. WEF staff cleaned out old files and also contributed other materials to be recycled. Shredded materials were placed into 363-L (96-gal) containers. The paper collected from both events filled 19 containers. In May, WEF’s Social Committee organized an event to supply food to the local community through Martha’s Table (Washington, D.C.). The nonprofit organization supports local families by providing education, food, and other resources. Its food truck, McKenna’s Wagon, provides nightly meals to community members. 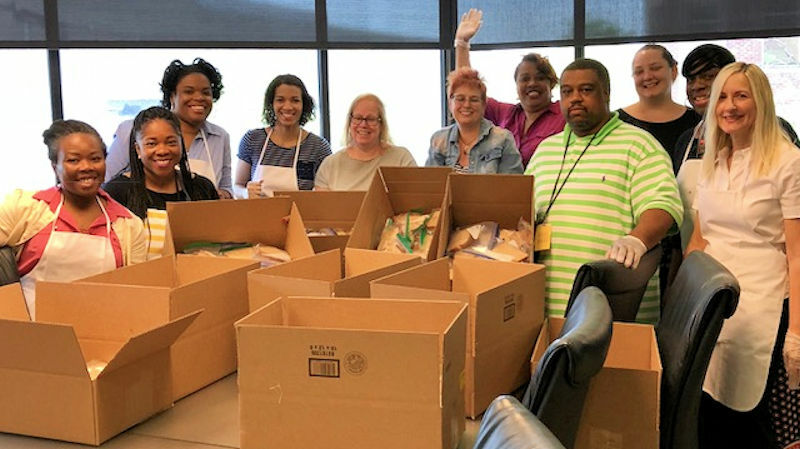 Many of the staff members who helped make sandwiches for Martha’s Table included, from left, Rahkia Nance, Camille Sanders, LaShell Stratton-Childers, Dymond Cooper, Lynn Thomson, Stefanie Walter, Theresa Mixon, Eric Neal, Julianne Jones, Tangela Williams, and Sandy Cimons. WEF photo/Sanders. WEF held a sandwich-making event with the goal of providing 250 peanut butter and jelly sandwiches to the organization. WEF staff came together to surpass the donation goal by making 300 sandwiches in less than 2 hours. Staff donated 40 loaves of bread, 10,773 g (380 oz) of peanut butter, 8505 g (300 oz) of jelly, and more than 300 sandwich bags to make the sandwiches. Unopened materials also were donated. WEF staff continue to volunteer for beneficial programs. A total of eight staff members have signed up for the National Bike Challenge. They have committed to the effort to reduce carbon-dioxide emissions by riding bikes for transportation as well as recreation. The team’s goal is to travel 3678 km (2286 mi) between May and September, representing one-tenth of the total registrants at WEFTEC 2017. Stay tuned to WEF Highlights to see if the team reaches its goal.